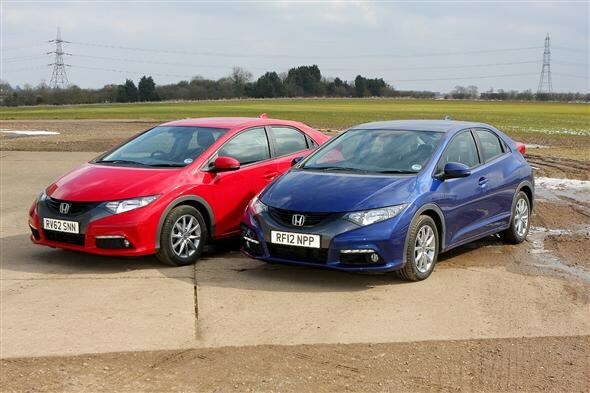 While our long-term 1.8-litre petrol Honda Civic continues to do sterling service, this week we’ve also been testing a Civic with Honda’s 2.2-litre i-DTEC diesel engine and a higher equipment grade. We drove it back to back with our long-termer to see how the two cars compare. The 2.2-litre diesel engine is a fair bit cleaner than the 1.8-litre petrol unit in our long-termer, with CO2 emissions of just 110g/km (not bad for a large engine) and an average fuel consumption of 67mpg. This compares with our car’s 47mpg and 143g/km. The diesel car sits in VED band B for road tax (free for the first year and £20 a year after that) and the petrol car in band F (£135 a year). Both cars have a six-speed manual gearbox, and it’s a treat to use thanks to its lovely short throw action and handy positioning close to the steering wheel. The diesel engine is impressively quiet and smooth; so quiet in fact that on dual carriageways road noise volume sometimes outweighs engine noise. There’s no shortage of power either – with 147bhp and 350Nm of pulling power it’s very effective if you need to press it into service for overtaking or when joining the motorway. As with many diesel engines there’s a dearth of power at very low revs and you can’t let it slog in a higher gear. Our long-termer’s petrol engine is very flexible by comparison, if ultimately not quite as punchy. We suspect keener drivers will have more fun in the petrol car, however, thanks to its sharper throttle response, smooth power delivery and broader range of performance. Both cars feature a stop/start system and Honda’s ‘Econ’ mode – push a green button on the dashboard and the Civic goes into fuel-saving mode by, among other things, dulling the throttle response and slowing down the energy-sapping air-conditioning system. It also triggers the ‘Eco Assist’ lighting scheme, where a series of coloured bars either side of the speedometer turn green if you’re driving efficiently and blue if you’re not. Our long-termer is in ‘ES’ trim, one equipment grade up from the bottom. The 2.2 diesel Civic tested here is in the more expensive EX trim, the next rung above. That means it gets leather seats (heated in the front) along with an enhanced stereo with a sub-woofer speaker in the boot and, particularly useful, an integrated sat-nav system. In the cabin, the leather seats look smart, although the fabric-trimmed seats in our long term Civic are just as supportive. The two stage heated seat control was very much appreciated in the cold weather, though. The sat-nav system is combined with the stereo and multimedia system in one touch-screen unit in the centre of the dashboard, which isn’t the most elegant looking device but works very well. The sat-nav splits its directions between the touch screen and the Civic’s smaller display screen next to the instrument panel, and it’s admirably clear and easy to follow. The multimedia screen also doubles up as a larger display for the reversing camera, making it a little more useful than the smaller display in our long-termer. Both cars share the same general Civic plus and minus points. Rear visibility is categorically awful, courtesy of the spoiler and wiper unit which splits the rear screen into two sections, and the steering has a disappointingly remote feel, but both cars are practical and comfortable with tidy handling and much to recommend them. Our long-termer Civic ES’s list price at the time of writing is £19,380 while the 2.2 diesel EX tested here has a list price of £24,075 (plus another £500 for the test car’s pearlescent paint finish). For reference, the same diesel engine in lower-spec ES trim costs £21,495. Both are impressive engines in their own way, but the jump of more than £2,000 to the diesel version (although there is also a slightly cheaper 1.6-litre diesel available) means you’d have to cover a fair few miles each year to make the extra outlay pay off in terms of fuel bills.